The Eames DSW Chair merges Charles Eames' love of plastic with the rustic appeal of wood. Our STIN Eames DSW Chair stays true to the original blueprint and is a joy to look at, touch and feel. The shell is moulded to the shape of the body and available in shiny fibreglass, matt plastic or cashmere. The unique Eiffel tower legs are constructed from beech wood and steel. Like the original, our plastic version displays round markings on the seat. This is a natural result of the legs meeting the material. 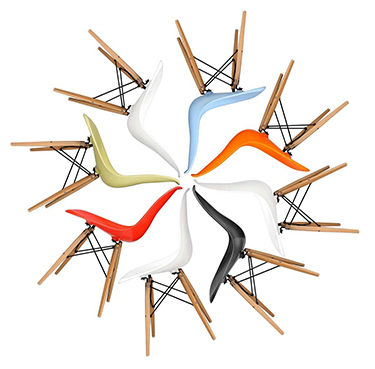 The Charles Eames DSW Chair comes in several colours including white, orange, red, black, blue and green furniture options. Created in 1948, the Charles Eames DSW Chair forms part of a series of moulded plastic chairs designed by the husband and wife team, Charles and Ray Eames. Each DSW Chair has the same ergonomically designed seat combined with different bases and arm styles. They are identified by their initials – for example, DSW stands for Dining chair, Side chair with a Wood base. This series of chairs has the iconic status of being the first industrially manufactured plastic chairs. Like its matching armchair, the Charles Eames DAR Chair, the DSW Dining Chair has a deep seat pocket with a curved high back and waterfall seat edge to provide extra comfort. Beautiful and chairs which our friends drool over!! Good quality, color and surface! I am very satisfied! Have had our two Eames chairs for 14 days now. They are beautifully made ​​of fiberglass and look like the originals. But the color of the wood is lighter than the picture. It was a bit disappointing. Really nice chairs and very comfortable. Definitely worth the money. I will buy from STIN again! A light and handy chair that is perfect for our holiday. It's good to sit in and easy to "keep clean" with its seat of plastic that can be easily wiped clean if necessary. I'm very happy with my chairs from STIN. They look exactly the same as the originals and totally worth the price. Great chairs and good price. Can nothing else than recommend Stin. Great chairs and good price. Can nothing else than recommend OSKAR. I'm very happy with my chairs from OSKAR. They look exactly the same as the originals and totally worth the price. Found this chair cheaper elsewhere, but have had bad experiences with quality. Do not mind paying a little extra for a product that will last for years and years! Very nice chair. Looks like originals and comfort is perfect. Could not ask for more. I give the Chair 5 stars.